Hello Kitty Online (HKO) has finally arrived in the Philippines. Sanrio fans of all ages can now go on marvelous adventures with Hello Kitty, Keroppi, Bad Badtz-Maru and the rest of the Sanrio gang in the colorful and breathtaking cities of Florapolis, Paris, London and a lot more. The HKO game was launched during the Bloggers' Purrty held at Yaku Japanese Grill at The Podium Mall on August 20, 2009. People were just excited to play the new online game and how it can turn into addiction. Some bloggers wore pink to show patronage to the popular cat character. I must say that the food at Yaku Japanese Grill was just superbly delicious! The taste and presentation of the food was undeniably one of the best among the restaurants that serve Japanese cuisine. Service was great too. I give them 5 stars (* * * * *). The charming surroundings and cute customizable avatars in the game are complemented by immersive, socially-driven gameplay which will surely keep everyone fascinated for many hours. Hello Kitty Online will allow the gamers to build their own dream homes, grow their farm, craft items and journey on fantastic expeditions with their friends. Gamers can get a free account with Sanriotown (http://sanriotown.com) where they can send emails, post blog entries, share pictures, play mini games, etc. The game has just entered its Founders Beta stage last August 17, 2009. Sign-up now for a free account at http://levelupgames.ph/hko. Slots are limited so go check it out before time runs out. Exciting prizes were raffled off. Then i won for myself a Hello Kitty big bag. Installers are available for download at the Hello Kitty Online Philippine site. You can also access the game at any Netopia branch. 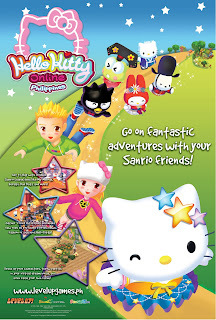 Hello Kitty Online Philippines is developed by Sanrio Digital and published in the Philippines by Level Up, Inc. - the first and leading online game publisher in the country today.